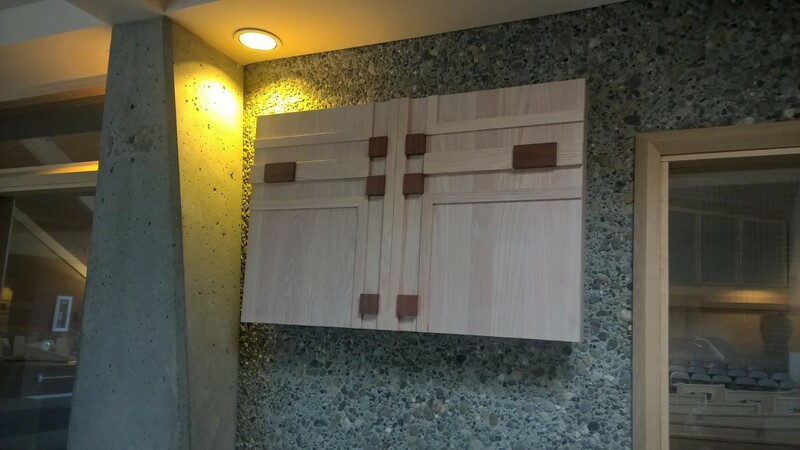 Four televisions installed in cabinets in the Narthex will be maintained and managed by Holy Family Staff. The purpose of the TV's is to broadcast the large masses we have at both Christmas and Easter and potentially any other large activity where we need to accomodate overflow in the Narthex. The South and Southeast TV's will be used for ongoing announcement of activities here at Holy Family and will be rotating each month. 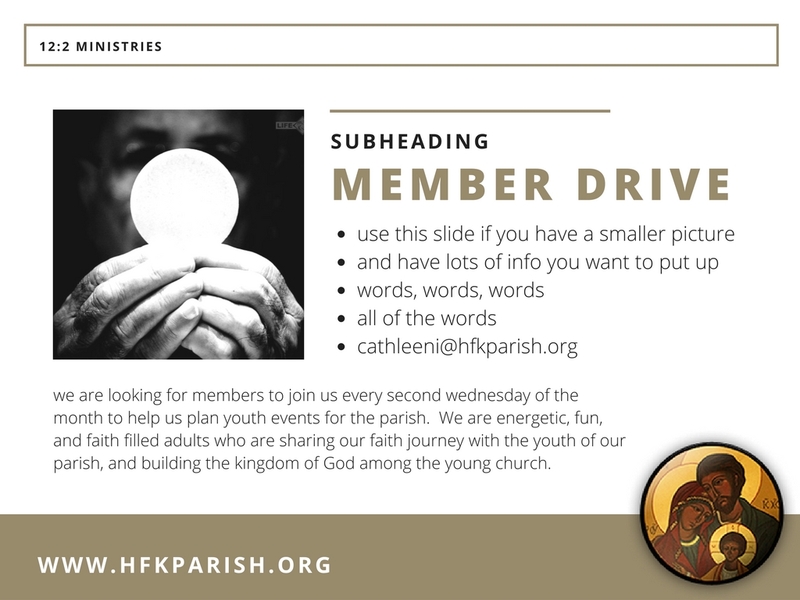 All parish ministries are welcome to submit announcements that align to the guidelines. Submit your completed announcement to your Staff Liaison for initial approval. ALL submissions are due by 9am on the first Monday of the month. There will not be any guarantee that announcements will run that are submitted past that deadline. ALL announcements must be submitted in Microsoft PowerPoint format on one of the preformatted templates that are available to the right. No fonts or layout may be changed but submitters are free to choose the layout that best meets their needs. 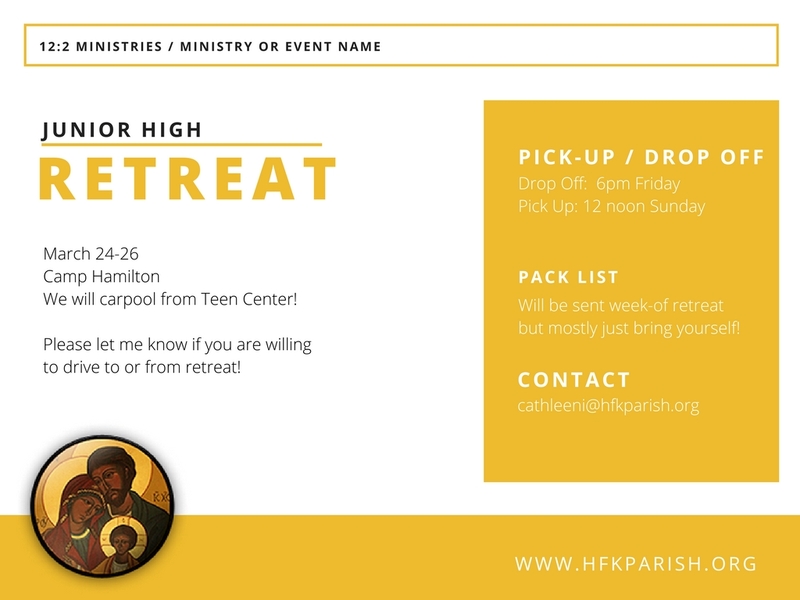 All submissions need to be sent to your ministries Staff Liaison for approval (click the Staff Liaison link to be directed to the Holy Family Groups and Ministries page which will lead to your staff liaison). Example: Sandwich makers – YES; Quilt blessing – YES, Group changes meeting time – NO, Young Adult Retreat – YES; Weekly or monthly meeting of a parish group – NO. Groups wanting to post an announcement to seek out new members will be able to do so at most every 2 months, space allowing, but no membership ads will be run on a weekly basis. The annoucement should be submitted on the Member Drive Template. Announcements can be added to the rotation UP TO one month before the event, but if it is a time of high demand, it may be held for a week or two, but will be prioritized as the event date nears. If you submit an announcement and your staff liaison or the committee decides that it will not run, you will be notified by email as to that decision and the reason for it. 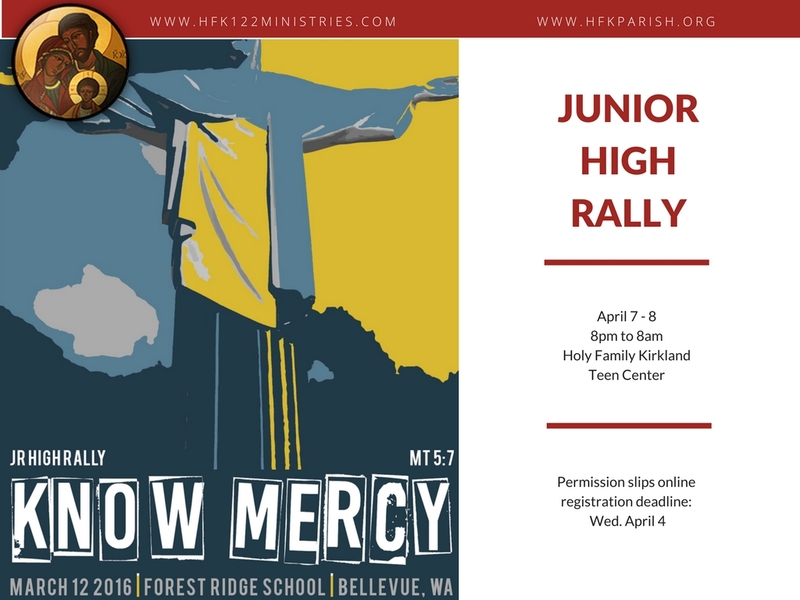 Sacramental events of the parish – Holy Days of Obligation, Christmas/Easter Masses, Anointing of the Sick, etc. 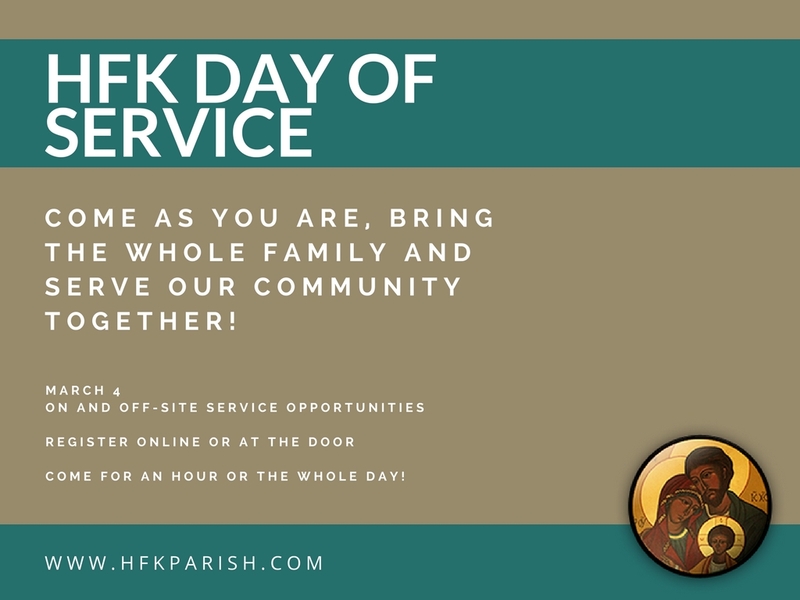 Parish Life – Crab Feed, Service Day, School events open to the parish, Retreats, Parish Missions/speakers, etc. 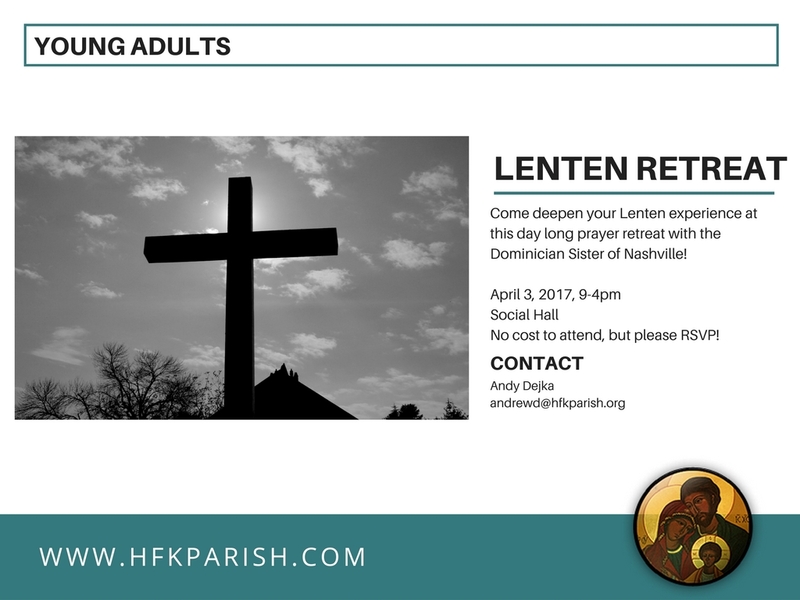 Catholic Events – Speakers/Missions/Events at other parishes, Archbishop Burnett Retreat Center, etc. 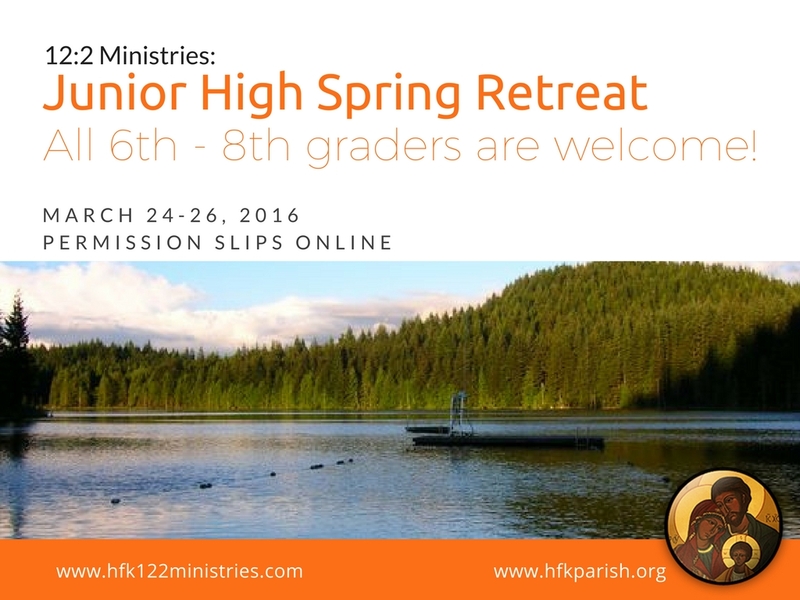 Please email your Staff Liasion with any questions. To submit an announcement, please use one of the powerpoint templates below, then submit them directly to your ministry's staff liaison. To Preview the Sample, click on the Thumbnail below. To access the template, click on the link below. Use this if you have a long, narrow picture (13.33x3.5). Use this if you have a 4x6 picture. Use this if you would like to recuit new members to your ministry or group. It accommodates a square picture. Use this if you only have basic text. Use this if you would like to highlight certain information about your event. Use this if you have an 8.5x11 flyer or vertical picture.